Thousands of Syrian refugees are pouring over the border into Iraqi Kurdistan, the UN refugee agency says. Up to 10,000 crossed at Peshkhabour on Saturday, adding to an earlier influx of 7,000 on Thursday. The UN High Commissioner for Refugees (UNHCR) says this is one of the biggest single waves of refugees it has had to deal with since the uprising against the rule of Syrian President Bashar al-Assad began in March 2011. The latest refugees are mainly families and have come from a broad stretch of territory in northern Syria. They have been taking advantage of a new pontoon bridge over the Tigris. 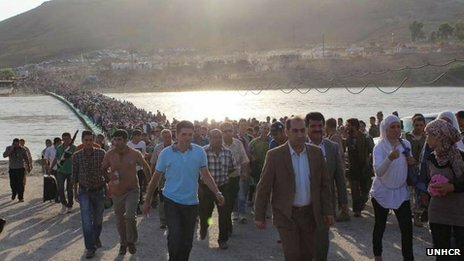 Some 150,000 Syrian refugees are already registered in Iraq, of the 3 million said to have fled Syria in total since the uprising began. The UNHCR says its field officers spotted the first group of 750 Syrians before noon on Thursday but in the afternoon, some 5,000 to 7,000 people followed. The UN said the latest refugees had come from Aleppo, Hassakeh, Qamishli and other areas of conflict. The UN said it was working with the Iraqi Kurdistan government and other agencies to establish a camp at nearby Darashakran. “This should open in two weeks, and our hope is it will relieve pressure,” Adrian Edwards said. The ethnic make-up of the latest wave has not been detailed. Kurds make up about 10% of the Syrian population and are largely concentrated in the north-east. They staged their own anti-Assad protests after the Syria conflict began in 2011 and their areas have been run by Kurdish local councils and militia since government forces withdrew last year. But the Kurdish militias have recently been fighting jihadists of the anti-Assad al-Nusra Front, leaving dozens dead. The president of Iraqi Kurdistan, Massoud Barzani, recently threatened to intervene to defend the Kurdish population caught up in Syria’s unrest. Massoud Barzani said if Kurds were “under threat of death and terrorism” then Iraqi Kurdistan would be “prepared to defend them”. Iraqi Kurdistan comprises three provinces in northern Iraq. It has its own military and police force.